Although payroll is one of the more fundamental business needs, our understanding of the function and its implications remains minimal at best. In fact, many business leaders rarely consider payroll beyond the basic requirement of paying employees, failing to realize the strategic value of this core function, which often represents the largest cost center of a business and claims on average as much as 60% of annual revenue spend. The challenges to understanding payroll are amplified when companies must consider multiple international and domestic locations, and begin looking into global solutions. What is it about global payroll that leaves people blank? Perhaps the answer lies in first helping people understand what global payroll is. Essentially, global payroll is the management of an organization’s entire payroll function for all locations via one system. From the early days of exploring foreign markets to today’s globalized economy, companies headquartered in one location have had to compensate employees working in another. And while the legalities and logistics of multiple payroll locations may be straightforward in some cases, the majority pose complex challenges to the payroll function and the organization at large, including conflicting regulations, data restrictions, benefits discrepancies, and much more. These wide-ranging challenges are just one reason why the details of managing global payroll can vary significantly across providers. There are plenty of ways to deliver compensation to employees on a specified date. However, new technology and cloud-based platforms are expanding the remit of payroll teams well beyond getting people paid. Today’s leading payroll platforms are elevating the function in terms of both efficiency and relevance, and in turn are empowering the enterprises who use them in new and exciting ways. If you look at the history of payroll models and their evolution over time and especially since the digital revolution, it’s clear how we arrived at the current state. Mirroring adjacent functions like human resources, the most advanced payroll solutions today use a single technology platform and centralized cloud data to deliver more accurate processing capabilities in real time. What does that mean? To explain, let’s first take a look at the common yet outdated “aggregator” method, in which one global service provider contracts multiple local payroll providers to process a customer’s payroll in various locations, then aggregates that data into a customer-facing application. On the surface, the payroll data may look the same. However, the processing has been done differently, depending on the local rules and disparate systems used, and a series of data transfers have occurred to get that final data into the aggregator’s system so the customer can access it. The problems with this approach begin with the fact that customers have no direct visibility into or control over the processing of their data, and continue through the lack of standardization in the final results. Because the data is managed differently across disparate systems, it’s all but impossible to prevent inconsistent, incomplete data. In contrast, a unified payroll platform uses one application and one source of data for all locations worldwide. Using the cloud for data storage enables payroll teams to maintain a single master data set that is accessible by all users whenever and wherever needed. Because the same data is collected for every location, according to statutory needs, and maintained in the one system, both the payroll provider and the customer teams have access to a comprehensive, complete, standardized data set — which means they have the big picture at their fingertips. Centralized global payroll is the next logical step in the digital evolution of enterprise service technology. In the early 2000s, sales and marketing took up the cloud to optimize and expand their capabilities, followed by human resources, then finance. Over the past decade, both the pace and platforms for performing the majority of tasks for all of these functions have fundamentally changed, from manual to automated, from desktop to cloud, from siloed to shared. 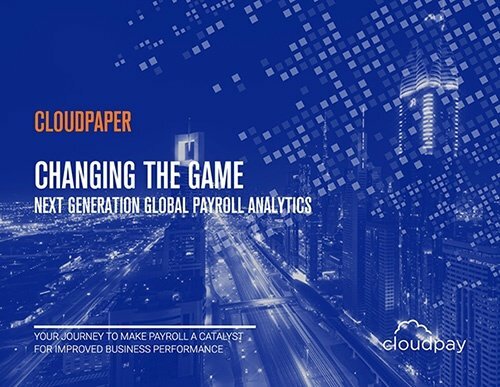 Yet outdated global payroll models persist, encouraging established enterprises and ambitious startups alike to funnel sophisticated, standardized HR and finance data into a fragmented selection of local payroll providers. The perception has been that HR and finance warrant the investment and deliver the insights, while payroll produces payslips. In our current data-driven economy, however, companies looking to leverage all assets are recognizing the depth and relevance of the data behind those payslips. 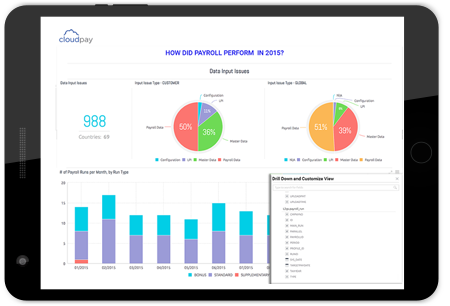 The payroll function maintains the largest continually updated source of company-specific data, and centalized, standardized solutions enable companies to access, analyze, and apply that data to key strategic needs, such as workforce planning and talent retention. Integrating a centalized, cloud-based global payroll solution with an equally sophisticated HRIS enables modern organizations to eliminate manual, back-and-forth data transfers in favor of shared single-source data. Payroll and HR teams can work smarter together, with aligned workflows and dramatically reduced processing times on both sides. In today’s fast-paced, digitized working world, it’s easy for service providers to talk around the issues most important to their customers. For an excellent example of this, try to find a services provider in almost any industry that doesn’t promise “analytics”. In truth, most of these providers deliver reporting metrics under the heading of analytics, while few actually empower their customers with real-time insights into processes and outcomes. When it comes to payroll, words like centralized and standardized are often used but don’t mean the same thing for every provider. Truly centralized data means information that is maintained as a single data set, also referred to as a Single Source of Truth (SSoT). This relies on cloud technology and use of one processing platform across all locations. Data standardization is a knock-on effect, in that because the data is collected, processed, and stored within the same system, it exists natively in the same format. What this means for payroll teams, as well as the related functions and service providers they work with, is that the historical need to maintain a master file and manage versions of that file is eliminated, along with the time and resources previously spent on those tasks. Another instant benefit is increased visibility of payroll data, which itself has significant knock-on effects, not the least of which is greater compliance capabilities and improved auditability. And another side effect of that data visibility: advanced, real-time analytics that reveal important truths and opportunities within a company’s payroll process. At the most basic level, centralized global payroll enables improved accuracy and timeliness of payroll processing. By eliminating outdated file versions and manual data transfer, unified solutions reduce the opportunitiy for errors to be made in the first place, while freeing up time for teams to address persistent issues and identify opportunities for improvement. By enabling comprehensive payroll data to be accessible as needed and in real time, such solutions eliminate wait times and facilitate faster processing. However, at this point in payroll’s evolution, these benefits should be considered table stakes. The real gamble in maintaining legacy payroll models is the risk of losing the valuable strategic insights made possible by today’s technology. The more fragmented a payroll system is—with multiple payrolls being processed by multiple providers—the less clear and useful the system is. If an organization’s only goal is to issue payslips, legacy payroll systems may meet that need. But for companies looking for more from their solution and investment, modern global payroll solutions are the way forward. Payroll represents an organization’s largest, most comprehensive, and most up-to-date source of data about its resourcing needs and human capital. And to date, most companies don’t use that data. Business leaders are now presented with the opportunity to seize upon the latest technology to equip their teams with payroll solutions that not only pay employees, but prioritize the things that matter to multinational organizations, including data protection and compliance, competitive insight, and resource management. It’s difficult to imagine a multinational organization that wouldn’t benefit from a unified, strategic solution for global payroll. However, plenty of factors must be considered before undertaking a payroll transformation. Change management is a hot topic for a reason: change worries people, particularly when it comes to an essential function like payroll that business leaders are understandably reluctant to disrupt. The first step in determining whether your organization is ready for centralized global payroll is to take stock of your current system, beginning with a full assessment of cost—including the often hidden costs of payroll—and where your solution fails to meet your needs. While it’s easy to call out the benefits of better payroll, it’s important to consider them in context of your organization and identify specific operational and strategic goals for a new solution. 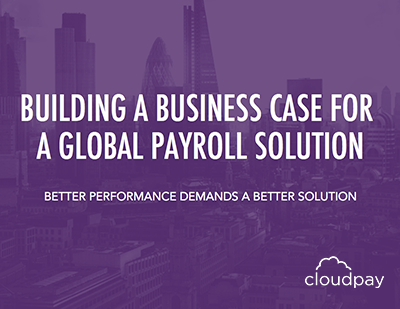 Global payroll today is much more than the desktop systems responsible for creating payslips. It provides the key to unlocking the potential of your most comprehensive strategic resource—your workforce—and to using the insights gained to transform not just payroll, but your entire organization.